NO FIRE TECH CLASSES THIS WEEK (Week of April 21st) DUE TO THE EASTER RECCESS. Enjoy some time with Friends and Family. 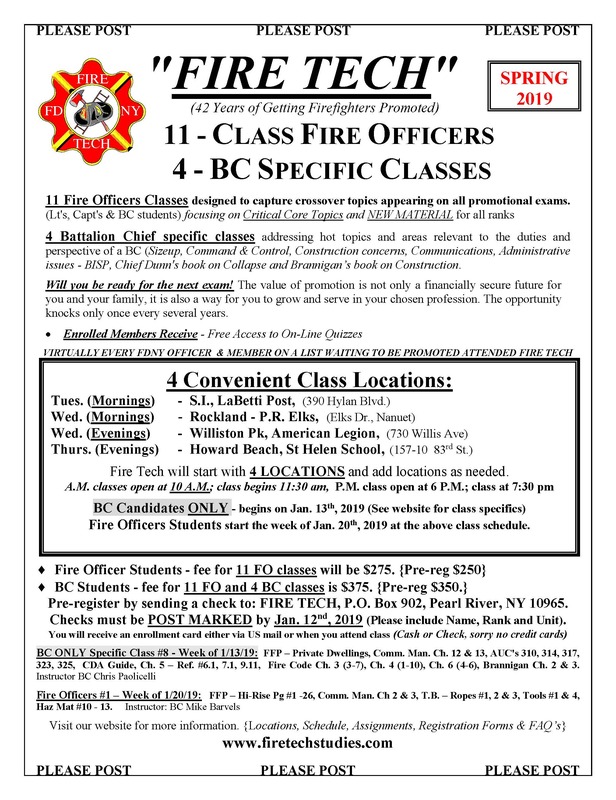 Fire Officers Class #11 will resume next week (Week of April 28th). Also the READING ASSIGNMENT for this CLASS #11 was REVISED: Delete Ladders 6 and replace with the ENGINE OPERATIONS CHAPTER #9. Thank You. 2019 Study Guides have been posted. View and download guides for Company officer, and Chief. You must be logged in to the site to use the online homework. Anyone having login issues, please use the "Request new password"
You can enter your username or email address to get a new password sent. There was a problem with passwords being reset, this has been fixed. Copyright © 1999-2011, Fire Tech Promotion Courses Inc. "Fire Tech"